The National Vetting Bureau (Children & Vulnerable Persons) Acts 2012-2016 provide a statutory basis for the vetting of persons carrying out relevant work with children or vulnerable persons. The Act stipulates that a relevant organisation shall not permit any person to undertake relevant work or activities on behalf of the organisation unless the organisation receives a vetting DISCLOSURE from the National Vetting Bureau in respect of that person. 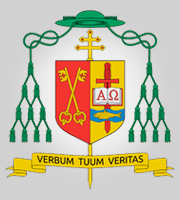 Please fill out NVB 1 Vetting Invitation Cashel 1 and return to Ms. Denise Fleming or Ms. Ruth Walling at the Diocesan Office, Archbishop’s House, Thurles, Co. Tipperary. Please note that where the applicant is under 18 the electronic correspondence will issue to the Parent\Guardian. This being the case, the applicant must provide their Parent\Guardian Email address and contact details on this form and not their own email and contact number.